A majority of the most influential figures in world financial centres now agree that the issue of moral hazard lies at the core of a resolution of the world’s financial crisis, but there is also an acceptance by most that it will never be possible to eliminate it completely from the picture. 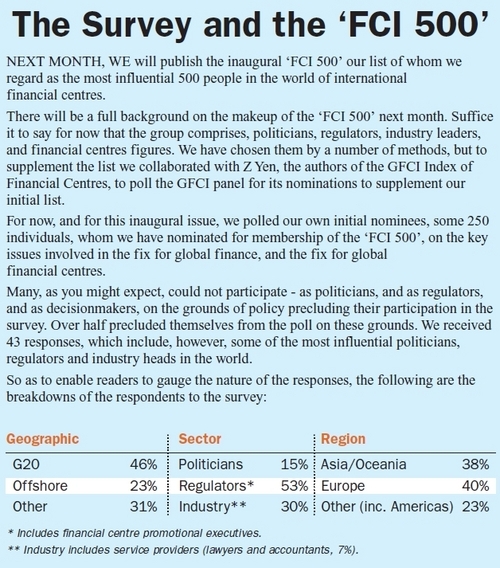 This emerges from a survey of views on the ‘Fix for Global Finance and the Fix for Financial Centres’ compiled from a panel of nominees contained in the ‘FCI 500’ a new listing of the most influential figures in global financial centres to be published in next month’s issue of Financial Centres International. 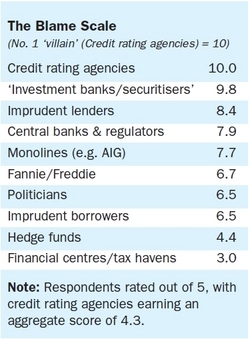 Our panel nominates credit rating agencies as the No 1 culprits. Why that may be so makes for interesting debate. For now, it is interesting to observe that at the inaugural GFSC conference held in Dublin in June 2008 (held four months before the failure of Lehmans) the then EU Commissioner for Financial Services, Charlie McCreevy announced for the first time the intention to introduce regulation of credit rating agencies in the European Union. At the same event, he was accompanied by SEC Commissioner Paul Atkins, a nominee of President George W Bush, who put forward the idea that bodies such as the SEC should withhold endorsement of agency ratings in regulatory oversight standards, a view that has now found legal expression in the new legislation passed by Congress, based on Congressman Barney Frank’s bill. (Atkins spoke on the topic again at the Dublin conference in April 2010). Said one respondent: ‘Central banks & regulators and Politicians failed to understand what their markets/operators were doing. Hedge funds were to blame only because they provided ready takers for Investment banks/securitisers’ products. For some, there will be surprise that politicians were let off so easily, especially since, according to a number of other surveys, finance has never been more politicised that it is now, and since, according to some, the ‘smoking gun’ rests in the hands of government. This, for example is the view of Peter J Wallison, former Counsel to the US Treasury, and Counsel to President Ronald Reagan in the 1980s whose analysis of the credit crisis at the same conference set out what he calls ‘an alternative narrative’ to the credit crisis. (Wallison is one of the two financial expert members nominated by the Republicans to the US Congress Financial Crisis Inquiry Commission). Said one respondent: ‘the quality of the regulators was in most cases a greater weakness than the regulatory system itself. Hence I apportion a high degree of responsibility to the regulators in some (but not all) countries, but much less to the politicians who designed the regulations. The major cause of the crisis was imprudent and in many cases irresponsible behaviour of the part of investment banks and some other financial services companies who failed to conduct proper risk assessments of all their activities’. And another: ‘Bad economic theory of the fundamentalist free market variety had too simplistic assumptions and led policy makers and regulators to be complacent, leading to moral hazard behaviour that they did little to stop. Investment bankers were too greedy and lost their moral bearings, causing capture of the system. Politicians did not understand and were led by the nose. According to another: ‘I think all of these and many other have contributed to the crisis. I could easily add a few further categories. This also means that blaming individual groups, or worse, persons, does not help: we should build the future, learning from past experience. The survey also indicates that moral hazard is understood to be a key element in the resolution of the crisis. This is supported by the fact that although a minority of 41 p.c. believe that the moral hazard issue is not central to a resolution of the crisis, the entire sample believe that it should be reduced, with 56 p.c. saying it should be ‘reduced greatly’, and an additional 8 p.c. saying it ‘should be eliminated completely’. •	‘Moral Hazard is a reflexive behavioural trait - it cannot be eliminated just as greed cannot be eliminated. It is reflexive, because the existence of moral hazard depends on the policy maker behaving to ensure that there is minimal moral hazard. If the policy maker rescues market mistakes through puts or options or appearing to condone moral hazard, are we surprised that the market takes advantage of this. Hence, the policy makers have absolute responsibility for ensuring the reduction of moral hazard behaviour, but I am not optimistic that those who seek popularity will ever do that’. (From: a head of regulation in one of the world’s key financial hubs) . •	‘No financial services executives want to see their companies become in effect government owned and run in the event of them becoming insolvent. Therefore it follows that moral hazard is far from being a central factor behind the financial crisis or a central element in preventing another one’, said a senior Finance official in a G20 country, while, summing up the overall sentiment of the panel, Eddy Wymeersch, the chairman of CESR concluded ‘it is impossible to eliminate it entirely but one can reduce it significantly’. When it comes to solving the financial crisis while not doing damage to their economies, (as G20 politicians stand on the cusp of making, or avoiding, some horrendous mistakes) the survey also makes clear that those centres that avoid the coming mistakes that are in danger of being made in the rush to fix finance, are poised to make major competitive gains for their countries. These opportunities lie mainly in the regulatory sphere, for, the panel, says (Question No3) the new regulatory developments will be the main factors influencing the popularity of centres. This is followed by corporate tax moves , and individual tax moves. In conjunction with this, in reply to the question ‘do you agree that special taxes on the finance/financial services sector, or on individuals employed in those sectors are wrong?’ two thirds agree that specific financial services taxes, are wrong. There has been the long standing ‘Tobin tax’ proposal in circulation, while many countries enact minor taxes, in the form of levies, and charges on financial services products such as credit cards, but the stakes have been dramatically raised in 2010 with the proposal supported by the US and a number of EU Governments (and opposed by Canada, Australia, and Japan) for a special levy on financial institutions to pay for the crisis, and to pay for resolution funds to finance future bailouts. One of the key elements in the fix for global finance has been the suggestion by many that remuneration practices need to be reformed in major credit creating institutions. This ranges from calls, at the more extreme end of the spectrum by a replacement of limited liability common stock holding structures, with partnerships, or the complete elimination of limited liability from credit creating institutions, to reforms of stock option rules, and remuneration caps. Without going into the details of these, we asked did the panel agree that ‘public demands for curbs (and special taxes) in financial sector pay & remuneration reflect a misunderstanding, or lack of understanding, of the workings of the private labour market in investment banking/financial services – compared with other, more easily understood yet more highly remunerated sectors, such as media/sports/inheritance?’. (The question is prompted by an idea by Thomas Sowell in his book ‘Economic Fallacies’ (2008) (pp 56-89). (Oprah Winfrey’s reported annual remuneration of $260 million, against Lloyd Blankfein’s $25m, and the average Wall Street head of $5m (‘Head of Diversified Financials’ in Forbes Magazine’s Compensation survey 2010) yet arguably, Oprah’s job (and inimitability) is more easily understood than Mr Blankfein’s, to the cab driver in the gridlock). On the regulatory fix for financial centres, there is overwhelming support for financial centres making their centres more attractive via better regulation. Commenting on this one respondent (Andrew Sheng, former deputy chief regulator in Hong Kong (and subsequently a board member of the Qatar Financial Authority)) said: ‘The current trend is to think that more complexity through more regulation would solve the problem. They may add to the systemic risks. We need to simplify the regulations to make them more understandable, with clear line rules that fit more emerging markets, rather than allow more complexity that invites more regulatory arbitrage’. And, said another respondent, (who is charged at present with the implementation of a plan to develop a major financial centre): ‘The primary goal of the regulators should be to ensure systemic stability and protection of consumers. This needs to be done in a way which does not discourage financial innovation and risk taking. But making their financial centres ‘attractive’ should not be a primary goal for a regulator. In the wake of the financial crisis, comprehensive, balanced regulatory systems are in any case likely to be attractive to investors’. The issue of moral hazard, and risk, and a particular danger for financial centres of exposure to systemic risk exacerbated by policy decisions, or, in the example of Lehman’s, a court, or jurisdictional-driven risk has surfaced as a concern for policy-makers. It is reflected in the suggestion of Jersey Finance’s Geoff Cook in his comment ‘measures need to be put in place to contain and limit the exposure of states to commercial risk’. And these, he says, do not relate simply to the size of institutions; it is a question of the uncovered risk assumed. And, to remind us of the difficulties for institutions in these scenarios, the CEO of one of the world’s largest insurance companies says ‘there should always be some scope retained to assist entities that get into temporary difficulty ‘through no real fault of their own’ and despite their own good governance’. Thus, on the question of eliminating moral hazard, completely, he says ‘it is dangerous to say ‘never’ when you cannot foresee all possible future circumstances’. Financial Centres, by their nature, are more likely to be judged on long-term issues such as reliability, legal and regulatory structures than they are by short term issues such as tax moves, and costs said one respondent. The critical short term factor in the re-ranking of financial centres is the way in which different governments and regulators are responding to the lessons learnt from the financial crisis, both with respect to possible regulatory changes and also new taxes and imposts on both individuals and companies within the financial sector. There was broad agreement on the role of good and better regulation, and indeed that taxation is a legitimate tool for the encouragement of financial activity. Said one: ‘Yes, of course they should concentrate on a more robust regulatory environment than hitherto, but my overriding concern is that many jurisdictions will simply respond to the crisis by overlaying new regulations over previously ineffective ones. On the crisis overall, Eldon said: I would refer you to a book (out of print) called The Country Banker. It outlines, almost exactly, the reasons behind the latest financial crisis - low interest rates over a long period of time, greed, innovation, imprudence, the role of the media - but it was written in 1875. ‘New measures’ are a constant reminder that the world moves on and becomes more creative. Systemic crises will come and go, no matter how firmly you think the stable door is locked. The primary goal of the regulators should be to ensure systemic stability and protection of consumers. This needs to be done in a way which does not discourage financial innovation and risk taking. But making their financial centres ‘attractive’ should not be a primary goal for a regulator. In the wake of the financial crisis, comprehensive, balanced regulatory systems are in any case likely to be attractive to investors.